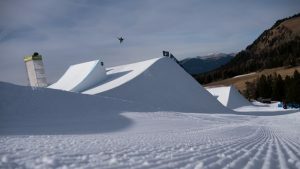 Seiser Alm, Italy – While X Games 2017 was taking place in Colorado, American freeskiers grabbed huge podium finishes at the FIS World cup slopestyle event in Seiser Alm on Saturday. Colby Stevenson, of Park City, Utah, earned his first World Cup win and Caroline Claire of Wilmington, Vt. earned her first World Cup podium with a third-place finish. Stevenson was the clear winner of the day, posting up superior performances on both the rails and the jumps. The 19-year-old member of the U.S. Freeskiing rookie team was joined on the podium by Colin Wili of Switzerland in second and Australian skier Russ Henshaw in third. It was a big finish for Claire, who was making her first World Cup appearance after finding great success on the Toyota U.S. Revolution Tour the past two seasons. Sarah Hoefflin of Switzerland took the win for the ladies, while French skier Colline Ballet-Baz took second. Next up on the World Cup tour for the freeski athletes is the Mammoth Mountain stop of the Toyota U.S. Grand Prix Feb. 1-4.